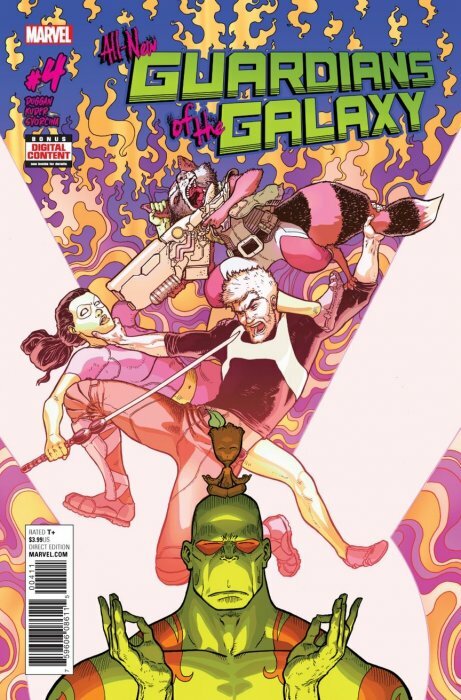 Continuing with my attempt to connect a bit more with modern mainstream Marvel comics (with the assistance of my new Longbox Junk collaborator, my comic lovin' daughter), I've been given this fairly short and recent run of Guardians of The Galaxy to consider. I have to admit that I really have no knowledge of Guardians of The Galaxy outside of the movies, which I think (in my extremely humble opinion) are some of the best Marvel has on offer. But I wouldn't mind learning a little more. From what I understand, this series was created for people JUST like me, who got a taste of The Guardians with the movies and want some more of their adventures. It features the same team line-up and similar character designs from the movies, and even though it fits into established comic continuity, it sort of trims things down a bit for new readers. In other words, this is supposed to be a comic that's been shaped by the movies more so than other Marvel titles. So. . .Guardians of The Galaxy for beginners? 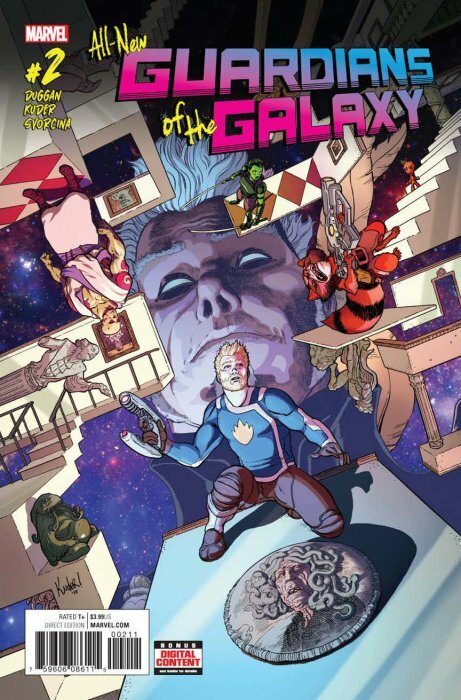 After the Guardians of The Galaxy team up for one last audacious heist (breaking into an impregnable vault to steal a miniature galaxy in a protective bubble using a gigantic fake Galactus to throw an entire planet into panic as cover), they quickly discover that they've been double-crossed and tricked into stealing from The Collector by his brother (and fellow Cosmic Elder), The Grandmaster. Now they're forced to remain together and try to pull off ANOTHER "last heist" in exchange for The Grandmaster's protection from The Collector. Nobody is happy about this. . . I found this to be a fantastic opening issue! It had action, humor, snappy dialogue. . .everything I was expecting from Guardians of The Galaxy based on my slim movie-based knowledge of the team. This was probably one of the most fun comics I've read in a long time, and it really makes me look forward to finding out what's going to happen next. The art perfectly compliments the light tone of the story. It's supremely-detailed, yet exaggerated. The brilliant colors really make the images pop on the panels. The artist really gives a great sense of scale that fits a comic dealing with the larger than life exploits of this team. Standout moments for the artist include the fantastic opening scenes with the Trojan Horse Galactus used in the initial heist. . .
. . .and the gigantic creature that The Grandmaster lives inside of. Overall, this is one of the best first issues I've read in quite a while. 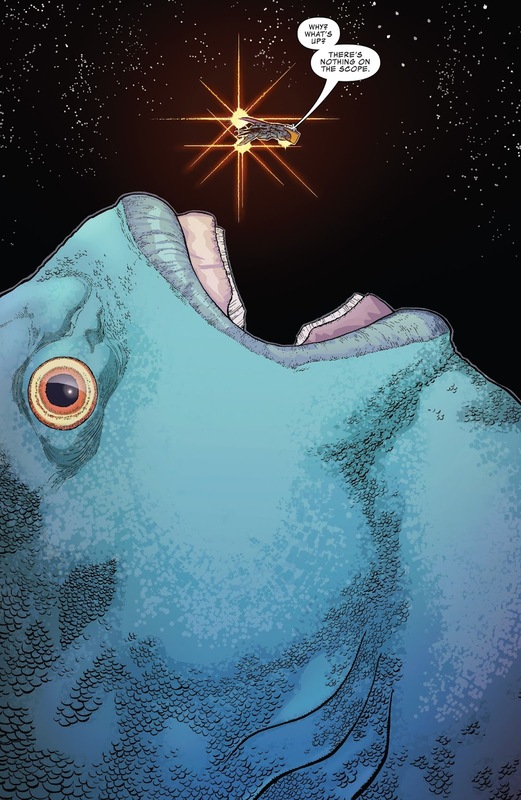 It sets the scene, introduces the characters, and dangles plot threads with a fast-paced and humorous tone, backed up by some really good comic art. The Guardian's plan to steal a "Hujahdarian Monarch Egg" for The Grandmaster by smuggling themselves into the Collector's heavily-guarded fortress inside the intestinal tract of a gigantic alien creature quickly goes wrong and the team finds themselves fighting for their lives before finally being captured by The Collector. Elsewhere, a mysterious figure seems to be farming an army of Groots. Another great issue with the same frantic action, snappy dialogue, and light, humorous tone as the first issue. The writer really nails the team dynamic of the Guardians not really liking each other that much, but also knowing that they work really well together. The art continues to impress, with the artist being able to move from the close in character moments of the Guardians planning the heist, and then later to the huge scale of the Collector and his fortress. . . So far so good. . .next issue! 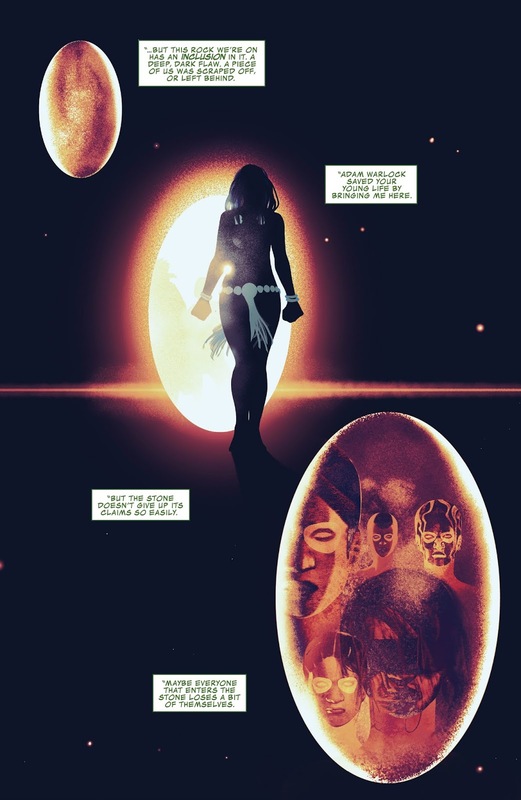 In a one-off issue focusing on Gamora, it's revealed that a part of her remains trapped within the Soul Stone (one of the Infinity Gems) that Adam Warlock used to save her life years before after a failed battle with Thanos. I guess that because this book was being double-shipped monthly, the regular artist got a bit behind and there are several of these "one and done" filler issues with guest artists outside of the regular storyline scattered through this series. I found it to be a jarring departure from a great start. It's not that the story is BAD, it's just not part of the "Team caught between two powerful beings" heist story I got invested in from the first two issues. In my extremely humble opinion, 3 issues in is a bit soon for filler issues. And then there's that this issue deals with continuity issues and storylines from THE FRIGGIN' 90'S that I had to wiki up on (The Infinity Gauntlet crossover event from 1991). To make the abrupt tonal change from "Forced into doing heists for rival Collectors" to "Part of my soul is missing" even more jarring, there's the aforementioned fill-in artist. While his shadowy, expressionistic art style matches the gloomy tone of THIS story, I really missed the regular artist's more cartoony style. Overall, I found this Gamora-centric issue looking back to what seem to be loose ends from a crossover that took place in 1991 to be a jarring shift and an unwelcome interruption in a story I was really liking. 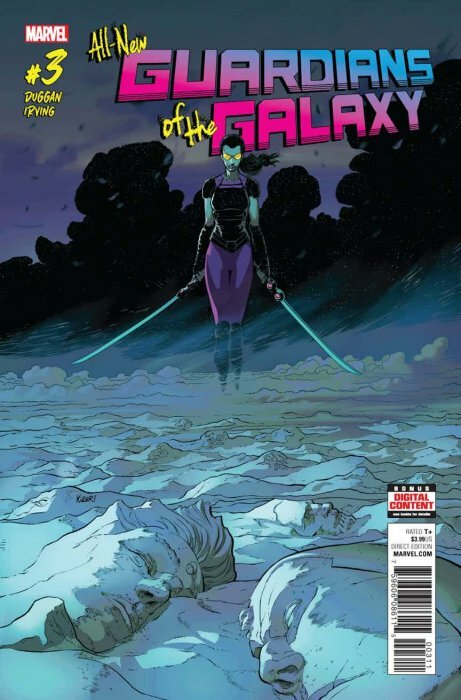 When the Guardian's desperate plan to escape The Collector fails, Gamora confronts the Cosmic Elder and makes a deal to double-cross The Grandmaster, now pushing the reluctant team into a triple cross between two powerful cosmic beings. What could possibly go wrong? 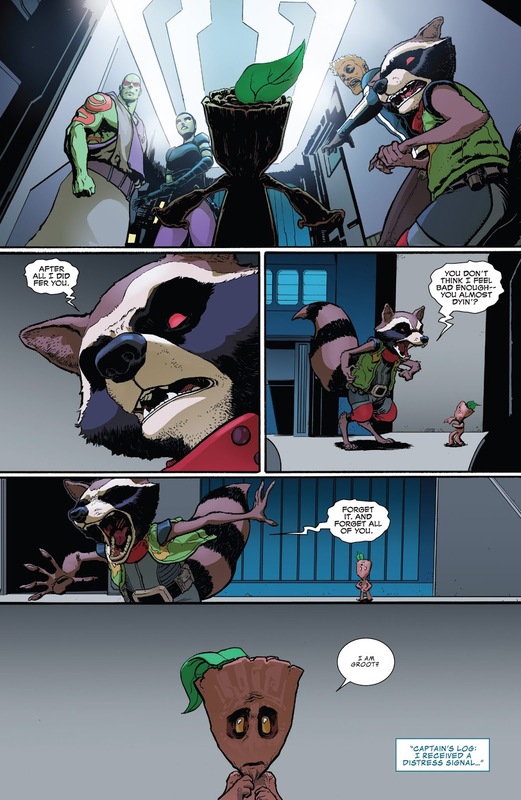 Also, Groot's inability to regenerate past "Baby Groot" form and his suddenly aggressive behavior begin to be a problem for the rest of the team. . .
And back to the story at hand! Most of this issue is a frantic running battle as the Guardians attempt to escape The Collector, but there are also some nicely-done scenes of tense negotiation between Gamora and The Collector, setting up the triple cross, that make this issue a great mix of action and dialogue. The regular artist also returns on this issue, bringing his excellent "Detailed, yet exaggerated" style back to this fast-paced heist story. Overall, a very welcome return to the story at hand, with some interesting twists and turns. 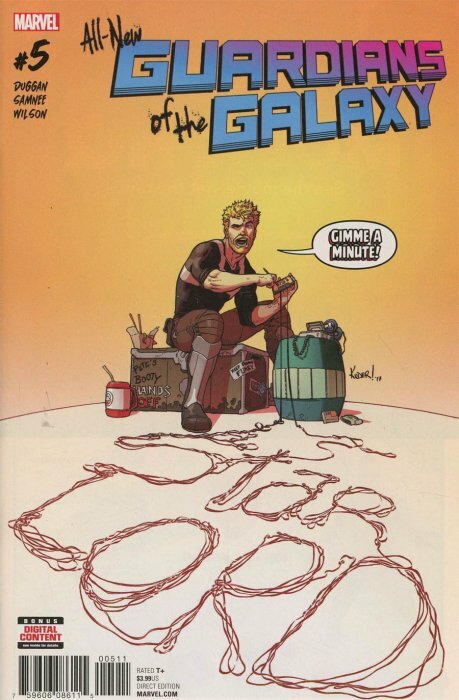 In this stand-alone issue focusing on Star Lord, we follow him across space and into restricted alien territory as he chases a radio wave from Earth to capture a song for his collection. . .
Only 5 issues in and we get a second "one and done" character-centric filler with a guest artist interrupting the flow of the main story. 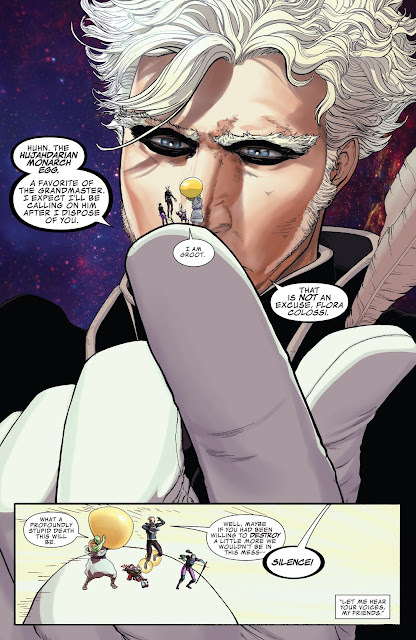 And once again, the story references events elsewhere (Deadpool, Nova Corps) that I needed to wiki up on. Fortunately, beyond the annoying interruption in the main story and new reader-unfriendly references, the story here is actually really good and the backup artist is Chris Samnee. . .and I happen to be a pretty big fan of his clean "Modern Old School" style. All in all, even though I'm a little frustrated by this being another filler issue, I liked this story. It's simple, has a nice heart (Star Lord's love of 80's music), and is backed up with some great art. So no harm, no foul. While Gamora confesses to the rest of the team that her true purpose is to find the Soul Stone and reclaim the trapped part of her remaining inside, the Guardians are attacked by the Fraternity of Raptors, who breach the Guardian's ship and steal a dead body that was hidden on board. 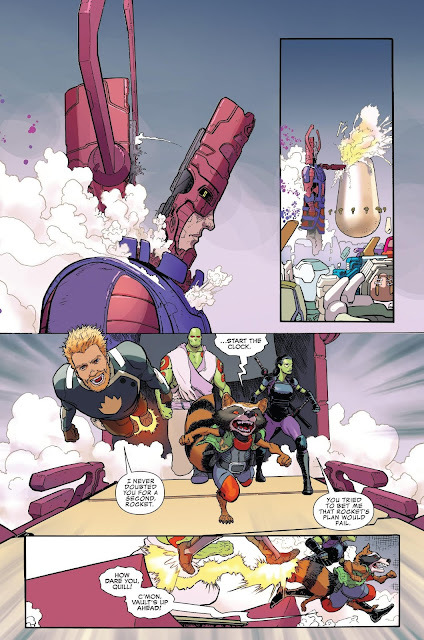 During the battle, Rocket manages to retrieve part of the body and the Guardians discover that they are now in possession of an ultra-powerful "Nega Band". Unfortunately, Rocket was poisoned by the Talon he fought for the Band, and the other band is in the hands of the Raptors. Elsewhere. . .a mysterious figure attacks an alien world with an army of bloodthirsty Groots. This isn't part of the ongoing "Triple-Cross Cosmic Elder Heist" story, but it's not a "one and done" filler issue either. It actually looks like the start of a NEW story arc INSIDE the ongoing story. It sort of comes out of nowhere, and isn't really new reader-friendly at all, with me having to do a little research to find out that the "Fraternity of Raptors" is connected to 2009 & 2010 Crossover events "War of Kings" and "Realm of Kings", as well as to cancelled Nova Corps and Darkhawk titles. In other words, this issue is a bit hard to pin down if you don't have knowledge of previous GOTG continuity. It's not that the issue is BAD. It just seems like there's been some sort of decision at this point to forget new readers and go in a completely different direction than this title started off on. I'm not quite sure what to make of it. 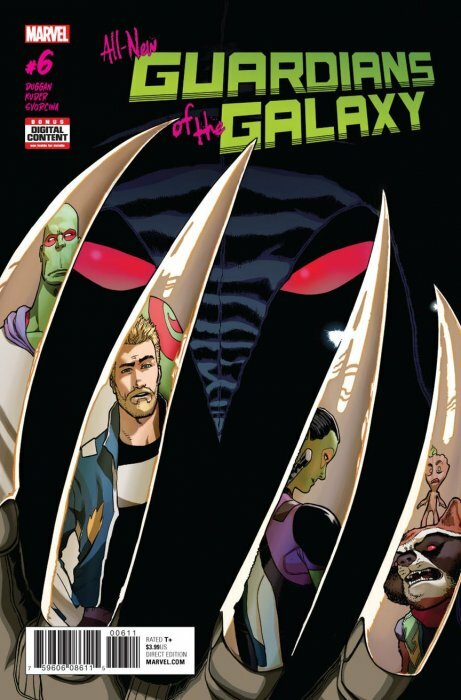 If I had to describe the front half of All-New Guardians of The Galaxy in one word, that word would be: Fragmented. What we have here is 3 issues of a fun and frantic double and triple-crossing heist story with the Guardians being thrown back and forth between two rival Cosmic Elders. . .Two single issues focusing on solo character stories for Gamora and Star Lord. . .and what seems to be the first issue of a completely unrelated story taking place at the same time. It makes for a somewhat strange reading experience. It's not BAD at all. The first issue is easily one of the best opening issues for a series I've read in a long time. 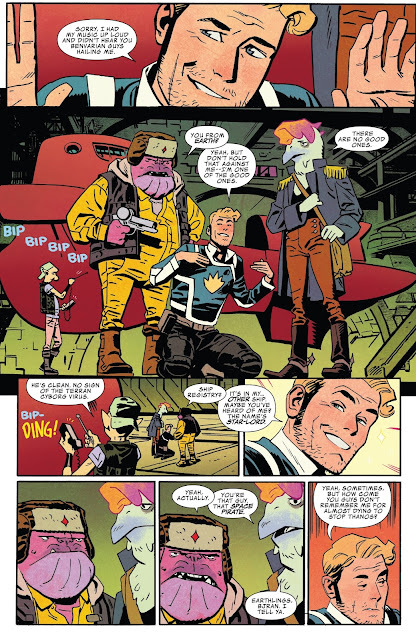 The Star Lord one-off issue was also really good. The ongoing heist story is fun and engaging. Unfortunately, I get the impression that this title is sort of swinging in the wind and trying to find a single direction to go. Overall, what I'm liking about this series I'm liking a lot. It's just too bad that it's so unfocused. 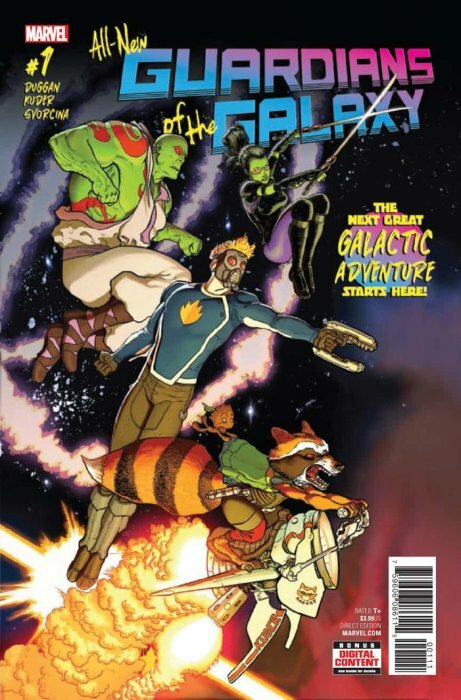 We finish up All-New Guardians of The Galaxy with issues 7 - 12. Will the back half find a direction leading to some great outer space action, or will it jump the rails and go off the cliff? Let's find out! Again, I really enjoy your assessment of the issues. I haven't read any of this series, but it never makes a difference, as your reviews are so good that I can decide if I want to try something or not based on your opinion. Thanks for your continued dedication to Longbox Junk!